Seymour Goodman, 90, father to Deborah Goodman, a Rockland County resident, died at Jacobi Medical Center, Bronx, NY, on November 24, 2016. He was a veteran of World War II serving from July 11, 1944, until June 21, 1946. PFC. Goodman was born on December 12, 1925, in Brooklyn, NY. 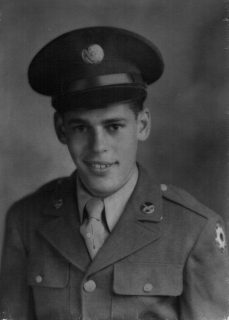 After serving in the U.S. Army, Mr. Goodman held various positions in the workforce before getting a position with the New York State Department of Mental Health. Mr. Goodman worked for the State until retiring in 1991 at the age of 65. Mr. Goodman got married April 2, 1954, to Shirley Wasserman, and had two daughters. Due to illness that befell his wife, Mr. Goodman raised his daughters by himself. He is survived by his daughters, Robin and Deborah Goodman; his five granddaughters Ava, Alexa, Alanna, Aria and Tara; sisters Sylvia and Shiela and brother Melvin. He was buried at Montefiore Cemetery in Queens, NY on November 27, 2016, with an Army Honor Guard present.